It has been quite a season already for the Michigan State Spartans basketball program. The team entered the season with high expectations and many had them as the eventual national champions. The Spartans returned some of their key pieces from last season in forwards Miles Bridges and Nick Ward as well as guard Cassius Winston. 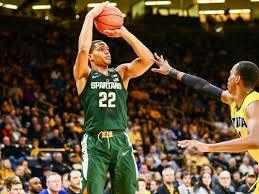 Bridges had a chance to head to the NBA after a strong freshman year but decided to return to help MSU win a championship. But along the way, a shadow was cast over their university and also their basketball program. In the wake of the Larry Nassar scandal, where Nassar worked with female gymnasts, ESPN offered up new allegations that involved members of the Spartan basketball program. This brought Head Coach Tom Izzo and the program under fire and created a distraction for the current players. However, Izzo tried to keep his team focused and concentrating on basketball while he was forced to try and answer questions from probing reporters. The team rallied behind their long-time coach and for the most part continued to win while rumors about the program swirled all around them. Sure there were some bumps, such as escaping with an overtime win at home against Rutgers, and coming back from 27 points down against Northwestern to steal a win. And there were a few losses along the way including an early season loss to Duke, a blowout loss to Ohio State and two losses to in-state rival Michigan. But other than those four games, the Spartans won every other game on their schedule to finish with a sparkling 29-4 overall record. In the final AP Top 25 poll, MSU finished as the 5th ranked team in the country. Entering the NCAA tournament and it’s new seeding process, they were hoping for no lower that a No. 2 seed but ended up as a No. 3 seed in the Midwest Region. The good news, however, is that they get to start the tournament at the Little Caesars Arena in Detroit, which will definitely give them a bit of a home court advantage for the first two games of the tournament. The Spartans first round game will be against the Patriot League regular season and tournament champions in the Bucknell Bison. Bucknell has been on a roll coming into the tournament having won 8 straight games and 18 of their last 19. Granted, none of those wins were against ranked teams but being a mid-major program, that’s to be expected. The Bison finished with a 25-9 overall record with a 16-2 conference mark. After a tough start to the year with losses in each of their first four games. Bucknell has turned things around and won their 7th regular season Patriot league title in the last 8 years. The team is led by senior forward Zach Thomas who averages 20.3 points per game and 9.2 rebounds. Senior guard Stephen Brown chips in with 14.9 points game and leads the team in assists averaging 4.3 per contest. And before you count Bucknell out playing against a national power such as Michigan State in their own backyard there are a couple of things to remember. It was just two years ago when a highly rated Spartans team took on another mid-major in Middle Tennessee State in round one and lost. Also, back in 2005 as a No. 14 seed like they are this year, Bucknell shocked Kansas in round one pulling the upset and advancing over the No. 3 seed Jayhawks. But the Spartans are heavily favored in this game and with a week and a half to get ready they should be well prepared. Izzo has a deep bench and is able to use his depth to his advantage. In addition to Bridges, Ward and Winston, the Spartans also feature freshman Jaren Jackson Jr., junior Matt McQuaid, sophomore Joshua Langford and senior guard Tum Tum Nairn. To get a win, the Bison will need to try and jump on the Spartans early and hope the layoff from the Big Ten tournament affects them. They’ll also need to find a way to counter the size the Spartans have up front with Ward, Jackson and senior Gavin Schilling. And as we all know, in the NCAA tournament anything can happen, so stay tuned.